In the universe that is interior design, Kelly Hoppen is a supernova. From her start as a teenager who transformed a friend’s kitchen, to coveted collaborations, homes, and hotels – she’s evolved to celebrity status – and four decades in, is in league with the greats. As a luminary in her own right, she regularly shares ‘top 10’ lists with the likes of Philippe Starck, Marcel Wanders, Jade Jagger, and Steve Leung — and, perhaps to no surprise, she also works with them all occasionally as part of the prominent YOO studio— a concept launched by Starck and property mogul John Hitchcox to combine the best in the business. Her project list looms large (in the thousands), and to date, she’s turned her gaze to almost every space imaginable – including A-list residences (both the Beckhams and Gwyneth Paltrow); to LUX*resorts (the Grand Gaube and Belle Mare), to planes, publishing, bars, brand collabs, buildings and private yachts – you name it, she’s done it, and likely got an accolade to boot. In fact, in 2009, she even received an MBE from the Queen. Lately, she’s focused her attention on several fresh frontiers, and most recently was tasked with redefining travel in the shape of the Celebrity Cruises Celebrity Edge — aptly ordained as “the ship of the future”. The visionary vessel, due to set sail this year, is a work of art on water and saw Hoppen join forces with renowned architect Tom Wright and US designer Nate Berkus in a bid to bring cruising to heel. 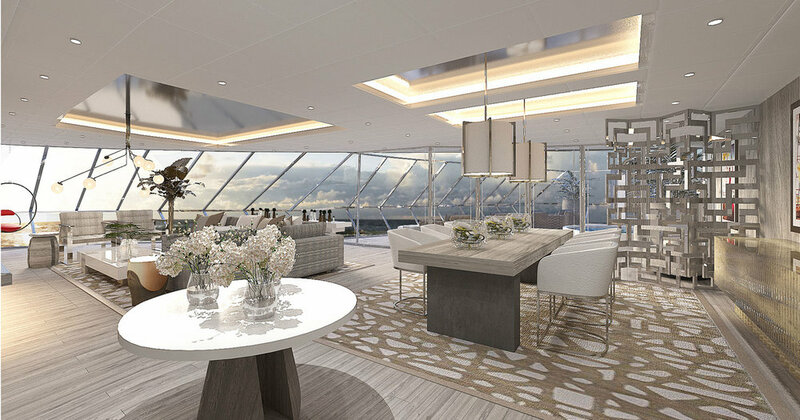 Sporting industry-first amenities, the ship is the first of its kind and is a tribute to modern luxury, with clean lines and contemporary interiors and cabins which boast Hoppen’s timeless designs. Not one to rest on her laurels, Hoppen has also turned to altruistic outlets of late, as an ambassador for Cool Earth with fellow style maven Vivienne Westwood, and via a tie-up with Tess Daly to launch a limited edition TRUST candle, in aid of the Prince’s Trust. In short, to chronicle her achievements completely is a wholly inconceivable exercise — although her recent House of Hoppen retrospective is a start — but what is clear is that Ms Hoppen is a master — and her East-meets-West aesthetic is here to stay. Yet, while her reputation is impressive and her empire continues to thrive, it is perhaps the unwavering consistency of her core design philosophy throughout it all that has truly cemented her place among the stars. As she says: “trends will always fade”, so while she ensures that every design is strictly custom, with spaces tailored to each client “like a dress”, she unswervingly sticks to her signature style rules, no matter the project at hand. Regardless of the interview, iteration or alliance, the pillars of her business prevail — simplicity, timelessness, textures, fusion, minimalism, modernity... and mushroom. The latter – a term for Taupe which she picked up in America – is her neutral calling card, and its consistent use of it throughout her trajectory has had her crowned the “Queen of Cream”. But while beige might be her colour, she’s certainly not playing it safe. Here, she talks to Tidlrs about her ambitious plans for the future and what’s made this South African expat an indomitable worldwide success. Tell me a bit about your business, and how the company has evolved since inception. As a child, my mother said I was constantly shifting furniture around our home and displaying everything at its best. I also had a passion for looking around show houses as it was a great opportunity to see design in action as well as visualizing how the designers expect their clients to live within the space. This has now evolved from being a hobby to part of my lifestyle. Through a lot of hard work, passion, and not being afraid to take the next step, I have managed to grow my business into a very successful enterprise. To what do you attribute this growth and what has given your business the competitive edge to stand out from the rest? It’s quite simple really; hard work and passion. I love and am proud of what I do, so it’s easy to put all my efforts into it. I work equally hard on every assignment; they’re all so different and unique. When each is finished, I get a sense of immense pride. There has always been a demand for my company’s services since I started in the industry, and things have remained very consistent. We do not let people down as we will always deliver the results my clients want. Our design is always evolving all the time which is important, and word of mouth is also truly essential to the brand. What materials do you generally work with and which trends have you seen (if any) in what luxury brands and high-­end clients are looking for from design services such as yours? I use the absolute best materials and teams to make my furniture, and each collection is a testament to my aesthetic belief in using modern clean lines but combining them with an eastern design philosophy. Textures, are very important to me, feeling is everything. It adds a new dimension to the room and to your mood. Whether it is velvet mixed with sheers or wood mixed with chrome, it is about the one texture bouncing off the other that is important. Linen, velvets and leathers are my favourites, you can combine these in so many ways to add depth and sensuality to a room. Trends will always fade. Trends have really been replaced by an absolute freedom to do what you like. My style is timeless and that is the sense that I create within every single project that I take on. I find it rather invigorating and refreshing to see such a huge variety of colours, textures, shapes and sizes. I tend not to follow trends at all but in London there are a few styles which I can see that really appeal to the masses. 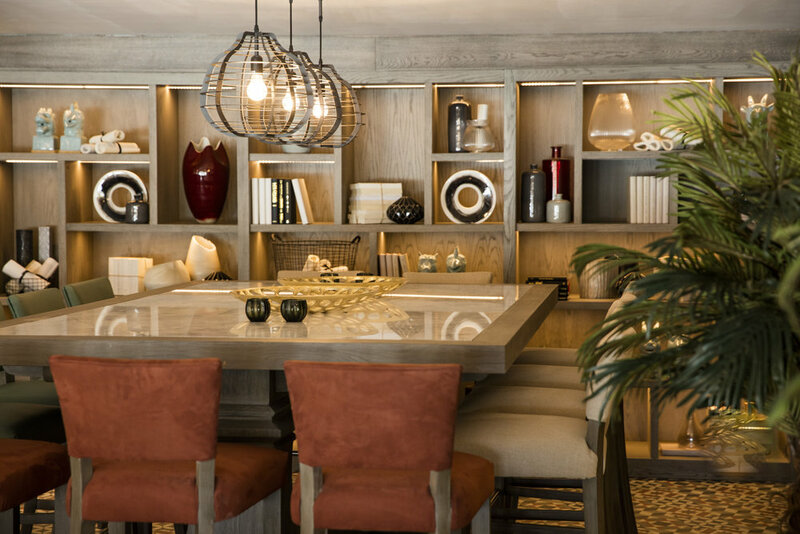 Using different shades of woods, especially darker wood tones to create retro glamour through furniture and finishings is growing as well as a focus on texture. Raw materials such as rattan and wicker create a handmade feel that is irresistible. How do you decide on the concept and ultimately bring it to life – what is the process between designer and client? When I am designing for my clients, I get to know them well in order to understand how they live within the space. A home must, at the end of the day, suit your lifestyle perfectly so it is imperative to ask all the right questions; and then tailor the space to them like a beautiful dress. But people know my style when they take me on. I obviously adapt it to my clients’ lives, but my design philosophy and basic methodology tend to remain the same and that usually keeps people happy! How has technology and the rise of the digital era impacted on luxury interior design? Before, food and travel were the leading categories for people’s interests, but now interiors are taking the lead. From social media gaining traction, to different styles and trends, to retail stores putting more love and attention into their displays and visual merchandising, the masses are starting to love and appreciate their homes and individual styles like never before. What is the most extravagant interior design you have ever worked on and what made it so? Each project is different; each client is individual and each finished home is a proud accomplishment. It’s always a highlight when you’re working on something that is conceptually unusual. So, for instance, working with Celebrity Cruises was a revolutionary project because it aimed to redesign the entire ethos of ocean luxury. We wanted to capture the escapism of a sea voyage and being far from your travels whilst also having a kind of urban luxury where you could be in Miami or Hong Kong. Another completely unique project was redesigning the First Class cabins for British Airways. Again, it was about working with an unusual and constrained space and transforming this into something beautiful and luxurious. As a designer, I had to consider the constraints of weight and space and safety in completely new and unexpected ways. It’s always incredible when you have your preconceived notions of luxury and design challenged by such specific projects. 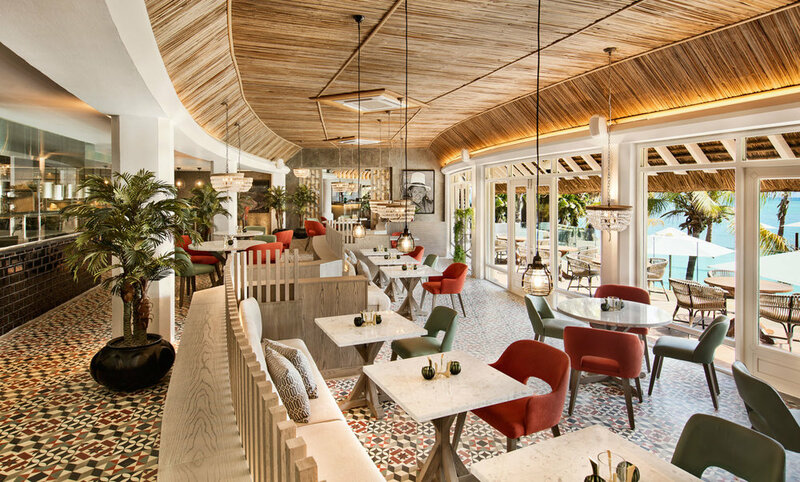 The recent redesign of the LUX* Grand Gaube Hotel and Resort in Mauritius was a huge refurbishment (estimated at around £22.81 million) — what as it like working with that budget? LUX* Grande Gaube was an existing hotel that needed a fresh pair of eyes and a rebuild. The first time I went to the site and walked around I was completely blown away by so many feelings and left feeling totally inspired by what I had to work with. So much of it reminded me of my experiences in South Africa whilst I was growing up whether it was the smell, the light, the foliage; it simply sent me into a total design frenzy. The focus was to create something new for the brand so that it was a different experience to Belle Mare so that the portfolio would expand and people had endless choice. The revamped LUX* Grand Gaube also has a "wellness centre like no other", according to the company, and this niche seems to have rising appeal amongst the affluent. Have you seen that trend emerging through the requests from your luxury clients? Wellness of course is imperative in my daily life and we all live extremely busy, non-stop lives so yes this market is popular. LUX* does this very well as it is part of their DNA and for me designing this kind of space is second nature as east meets west is core to my design philosophy and so creating the essence of that in a modern way for me is fundamental. In terms of your work with luxury and high-­‐end clients – are there any particular trends you see in your work that differ when working on different regions of the globe? In China, for example, you worked on the very exclusive address One Shenzhen Bay — did you find any particular differences between the Chinese market and the UK market? The Eastern principle of simplicity is key to my design philosophy. My project One Shenzhen Bay, located in one of the most sought-after and exclusive areas in China, was just awe-inspiring. We set out to create a ‘Design without Limits’ and I truly do believe that we achieved this! Nothing was too big, and it felt like we condensed the world into that project as each apartment was based on a different city. It is the awesome scale of creation in Shenzhen that fascinated me throughout the project. You’ve been an avid supporter and ambassador for the GREAT Britain campaign — how do you add that British twist into your own client work? British style is all about timeless elegance; it has always been about comfort and texture more than about anything else. We as British are about how we live first then the look. I believe my design philosophy portrays just that. Texture is everything to me and always has been. Whether it is velvet mixed with sheers or wood mixed with chrome, it is about the one texture bouncing off the other that is important. My style is world-wide, it evokes my design philosophy of creating harmony, which is the key to my successful interiors. The colour palette I use in all of my projects is very neutral and calming, this always results in fantastically elegant and timeless spaces. I do love to complement this with great accents of colour which can also transform a room and portrays that sophisticated British feel. You seem to be consistently breaking new ground — where do you draw the inspiration? Every day is different and every single day is non-stop from the moment I wake up. Upon waking I try to sit and meditate for 15 minutes, I am so busy each day that I need to take a little time just to center myself in preparation for the day ahead. I also love working out. I am inspired by my travels, especially the markets and flea markets that I have explored throughout the world during my 40 years in the industry. What attracted you to the Celebrity Edge project in particular? Celebrity Edge is definitely a ship of the future – nothing like this has ever been done in this industry before. I was so honoured to be part of something this ground-breaking and it was a challenge for me to do something that no one had ever done before. The craftsmanship and quality that Celebrity Cruises follows is second to none and their reputation for innovations in the industry is already renowned so it was an incredibly exciting project to work on. The idea behind the Celebrity Edge is that it will attract a younger demographic to the cruise industry — how did you incorporate this mission into your interior designs for the ship? I wanted a space that embodies timeless luxury. The interiors couldn’t be too overdone because it would make you feel too enclosed and claustrophobic. So instead, I stuck to neutral colours and a minimalist style, with an emphasis on clean lines and geometric patterns with lots of textures and vintage glamour. You’re constantly inking new collaborations, like your signature mural collection for Graham & Brown and second collaboration with Apaiser. How do you select your brand partners and consistently keep your finger on the pulse of what consumers want? It is quite organic and very simple - like a friendship. You know as soon as you meet and that you have things in common. From then, it is all about building the collaboration together; the design aspect comes from me and distribution from the partner. What’s next on the horizon for your company and for you as an entrepreneur? So much is happening and so much will be announced in the upcoming months! I have very big plans shortly and exciting upcoming collaborations. It never slows down and at Kelly Hoppen we are very much looking forward to the future! This article was originally published in Tidlrs / Journal. An exclusive interview in Paris with the head of one of largest luxury conglomerates on the planet, revealing his plans for an ambitious company-wide transformation – in just 900 days. The very survival of luxury fashion rests on its ability to face climate change – and yet most major players are missing the mark on sustainable innovation. Here, we investigate why.